When the clinical procedure alone fails to achieve accurate diagnosis, there is need to proceed from the simpler, more innocuous technique to other more complex invasive investigations. Radiography is one such simple procedure. They have limitations in their ability of visualization of pathology. Various experiments were performed with various materials to enhance the absorption or transmission of the X-rays and found that if the density of a structure of interest is too low to be visualized on an X-ray image, or if the subject contrast is too low to meet specific diagnostic needs, the contrast and density can be improved artificially. Thus the introduction of contrast agents and its application In contrast radiography assumed a pivotal role in the present day diagnosis and treatment of diseases. At this juncture an attempt has been made to review the literature regarding the history of contrast media, chemistry classification, Ideal requirements, adverse reactions and its use. "Oral cavity is the reflection of an individual's general health" .Many systemic diseases have manifestations in the oral cavity. Systemic influences,such as endocrinal, immtlnological, nutritional and psychological states have an important role in thebalance between oral health and disease. This also holds good for a well known mucocutaneous disorder - "Oral Lichen Planus". The present study is carried out to deteremine any co-relation between oral lichen planes and chronic liver diseases. Computed tomography is an advanced tomographic technique in which a particular section of the body which has to be imaged is reconstructed with the aid of computer technology. 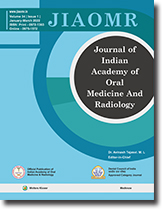 Computed tomography is applied in the field of oral diagnosis in the evaluation of tumors and traumatic conditions of maxillofacial region particularly to assess the soft tissue involvement in these conditions, to establish the contents within a lesion and to determine the vascularity through intravenous contrast studies. Five interesting cases of mandibular ameloblastoma are presented here, each case showing different histological pattern and corresponding computer tomographic appearance. Also an attempt is made to establish CT pattern in these histological varieties of ameloblastoma. Condylar hyperplasia is a rare malformation of non neoplastic origin, wherein the size and morphology of one of the two mandibular condyles is affected. It is reported as a self limiting process that is generally seen in patients between age group of 11 to 30 years. It appears as an acceleration of growth in young patients which arises at the same time of physiological condylar growth or as an unpredictable growth spurt in adult. A case of a middle aged male patient afflicted with oral submucous fibrosis was noticed by the department of Oral Medicine, Bharari Vidyapeeth's Dental College & Hospital,Pune , when the patient reported to the department with the chief complaint of a painful lower left molar. On clinical examination, oral submucous fibrosis was diagnosed. The only positive history of tissue abuse habit given by the patient was of the use of tobacco containing toothpaste since many years. Research findings should be used by practitioners to provide good health care to people, this is not happening for a variety of reasons. This paper discusses the different hurdles for developing research into practice, and the state of research in the Indian health care sector. Two unusual and interesting cases of acoustic (vestibular) schwannoma are reported, The advances in diagnostic imaging and their importance in early detection of these tumours is also discussed. Osteogenesis Imperfecta is a genetic disorder affecting approximately 20,000 U.S. population with multiple fracture of the bone. The, actual literature of the number of patients suffering from Osteogenesis Impcrfecta in Indian Population is still nor available. This is a case of a male patient who presented to the O.PD. of Subharati Dental College with history of pain ands swelling in the left lower posterior teeth region. On detail workout of the case it was found that the patient had Dentinogenesis Imperfecta Type I with Type III Osteogenesis Imperfecta. Very few cases with such presentation is reported in Indian Literature. The following report presents the clinical findings of Osteogcnesis Imperfecta and an associated review of Literature. A patient is presented with central giant cell granulorna (CGCG) of the anterior mandible along with a brief discussion on the various treatment modalities in light of the current literature. The case is reported with clinical, radiological, histological and surgical aspects of the lesion.